Hirokazu Koreeda's I Wish is one of the few recent foreign language movies that managed to pinch my heart with just the right amount of strength that is enough to make me feel the pain without giving up on hope that the release from gripping misery can bring freedom just as much as it can bring sadness. Two brothers are forced to live apart when their parents separated. 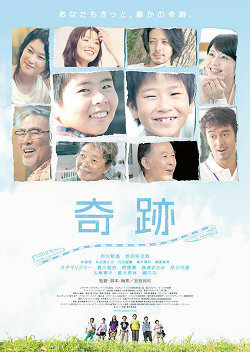 Wanting nothing else but to reunite the family, they device a plan to meet at a train station which, they heard, grants wishes. Click here read about another another Japanese gem, Sway. There have been other reviews about this film and almost all bring a certain amount of justice to the beauty of the movie. I will not repeat what everyone already eloquently said but I will just enumerate the things that I think is noteworthy about the movie. 1) The two brothers both wanted the family back together but one more so than the other. Koichi is eager to bring their parents back together but Ryu dreads the thought of going back to the everyday fights and feels peace in silence of his current surroundings. It is interesting just how two kids who want the same thing can be so different in how they want it. It is painfully familiar and also a little embarrassing when we start realizing that these brothers represent just about all kinds of relationship. Often, people want to stay together whether it be friendship, siblings, romance, etc. The devil is in the details. What sets the difference is how we want to live our lives while we are together. 2) The movie is unmistakably about the "adventure" of how these two brothers will get to the train station so they can make their wish. However, there are so many people around them with just as interesting stories. At some point, you will wonder which ones are significant and why they have to happen. The answer to the question was delivered by the boy's father, Kenji (Jo Adagiri), "Some of the things in this world HAVE to be useless. Imagine if everything is significant, you'd choke." Then you pull back and realize that if you take it the way he said it, even the "useless" things are important. 3) Just as the film progresses and the children sees the realization of their goal, both realize that they are not certain what they really want. Do they want the family back together or do they want a family and its shape and form is not important? As the two try to make sense of their emotions, their ideas and feelings fuse and mix. That is the only time they realize what they truly desire... perhaps. 4) The film beautifully and ever so accurately depicted that pain that uncertainty brings. And even more painful is just how uncertainty becomes inevitable when one is about to grasp the realization of a dream. 5) The best part of the film just how the director managed to depict the purity and innocence of a child and the wisdom that old people can pick up from them.